GUY Delisle is the author of Pyongyang and Shenzhen—portraits of North Korea, an eerie, frozen totalitarian state, and a developing Chinese boomtown. He took his pens and sketchbooks to Burma for a year in 2005, accompanying his wife, Nadège, who was stationed there with Médecins sans Frontières (MSF) France, and their toddler son, Louis. 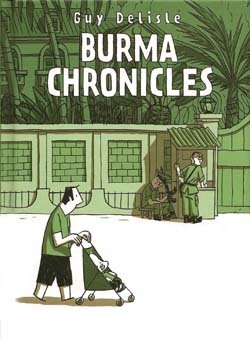 In Burma Chronicles, Delisle self-deprecatingly depicts himself as a lumpish figure pushing a baby stroller, often confused, frustrated and on the sidelines as Nadège fights malaria. While lacking the black and white bravura of other graphic storytellers such as Marjane Satrapi (Persepolis) or Alison Bechdel (Fun Home), Delisle shows his skill in sharp vignettes of everyday life. His most telling insights about Burma, come in the tiniest frames. Although determinedly small in scope, the book takes on layers of themes: expat life, tourist impressions, political commentary and the role of international NGOs. Eventually, Delisle forms real friendships with a group of Burmese cartoonists, running an informal computer animation seminar for them. In typical Burmese fashion, this ends up fraught with danger for the Burmese when a French journalist writes an anti-regime story quoting Delisle, and the group fears arrest for guilt by association. Occasionally, Delisle accompanies Nadège upcountry on tours of MSF projects, and he illustrates conversations about MSF France’s withdrawal from Burma because it believed that the regime’s travel restrictions kept it from fulfilling its mandate to help people in conflict zones. Delisle and Nadège also go on some tourist excursions to places like Pagan and Inle Lake, resulting in a series of evocative pen and ink snapshots without words. Delisle’s grasp of Burmese politics is literally sketchy, and it comes across best in imagery like a minute figure, Aung San Suu Kyi, standing inside an outline of her house. A newspaper is a lattice with all the articles cut out by censors. Army officers’ uniform shirts have low-set pockets to make room for ostentatious ribbons and medals. Expats lounging at a swimming pool speculate about who set off bombs in the city. French energy giant Total’s Burma pipeline fuels air-conditioned Bangkok, but in Rangoon, “We stop to pay the power bill in a building that is plunged in darkness.” Combining such elements, Delisle draws his narrative of a captive, exploited country. Delisle was living in Rangoon before the real flowering of Internet cafes. One of the best chapters of Burma Chronicles involves an attempt to fix a blocked e-mail address that culminates in a trip to Myanmar Posts and Telecommunications—one of Burma’s two Internet service providers at the time—with a glimpse of a hulking mainframe computer and a guard in a dim room. Like other foreign visitors, Delisle is fascinated by the many antiquated and quirky elements of Burmese life: a Morse code key still in use, long ropes with clips hanging from apartment windows for hoisting up packages, reliance on bank ledgers and WWII-era fire trucks. He gets classic nonpolitical laughs from his Thinggyan soaking and the sudden onset of the monsoon.